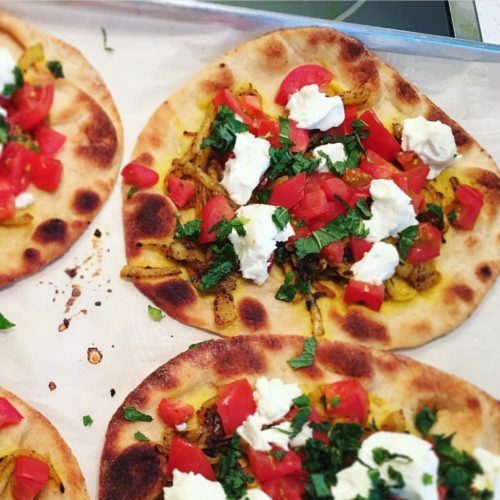 I serve this delicious flatbread at my wellness lectures. People can’t get enough of it. It is loaded with flavour from the turmeric spiced onions, sweet tomatoes and the fresh mint. It can be made for one person or a crowd! Use a pizza cutter to easily make bite sized pieces to serve yourself or guests. There is a whole teaspoon of turmeric which has anti inflammatory properties. The recipe calls for black pepper which contains Piperine. This helps increase the absorption of turmeric in your gut! The fresh mint is not only pretty, it has anti-bacterial components. So delicious! When you are buying bread in Canada, you have to look for ‘whole grain, whole wheat’ on the label. If you buy multi-grain, it may not be high in fibre. Check your labels!